(Newser) – The world's tallest mountain is covered in a whole heap of trash. 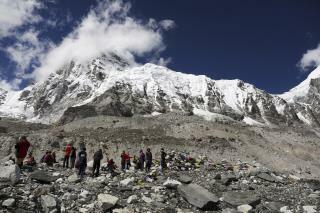 That's why a Chinese team of 30 people has been tasked with hauling decades worth of climbers' garbage off Mt. Everest. Since April, they've managed to bring down over 9 tons of cast-off mountaineering gear and other garbage, the Reuters reports, citing the state-run Global Times. However, lost carabiners and old tents don't make up all the junk. Human waste and household waste made up over two tons and five tons of the removed mass respectively. Since the task is an extremely arduous one, officials in Tibet have given every climber since 2015 on Tibet's side of the 29,000 foot peak two trash bags to use to bring back down at least 8 kilos of trash, or over 17.5 pounds. A climber is fined if they come up short. People can't be trusted to save the environment. Just like at some state park, it should be a carry-in carry-out policy. Now if they could start cleaning up their trash hole of a country. Worst polluters on the planet but you will never hear a radical lefty ever complain.